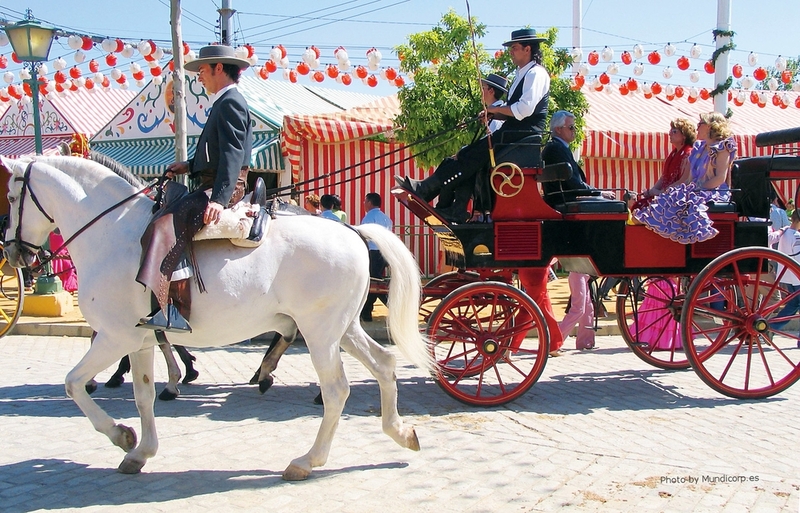 The Feria is a week long celebration that takes place every year, two weeks after Semana Santa. It's located a little outside of the city's center on a huge 24-block lot called the Real de la Feria, which is reserved solely for this week's events. Within the grounds there are streets lined with casetas, horse-drawn carriages, lots of dancing, live music, and a huge area with fair rides and attractions. The casetas are little buildings that are owned by families, groups of friends, or social clubs. Each of them has a bar where you can order food and drinks, a sitting area that turns into a dance floor, a working bathroom (remember this is only used for 7 days out of the year!) and usually a bouncer. The casetas are mostly private, so an invitation is necessary. 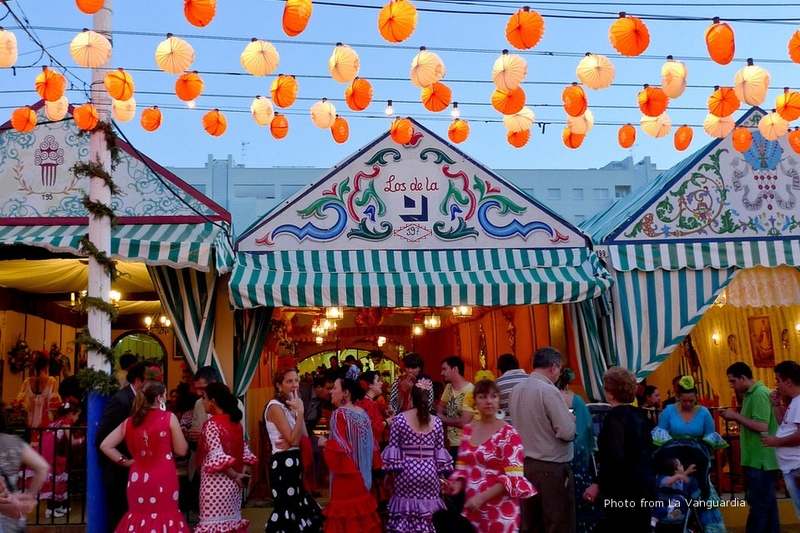 The main entrance of the Feria, or la portada, is designed and constructed differently each year, and is a popular meeting point for friends and family. The first Monday is called el pescaito because friends and family get together for a dinner which consists mostly of fried fish and tapas. And at midnight on this same night, the whole portada lights up, the crowd cheers, and the party starts. 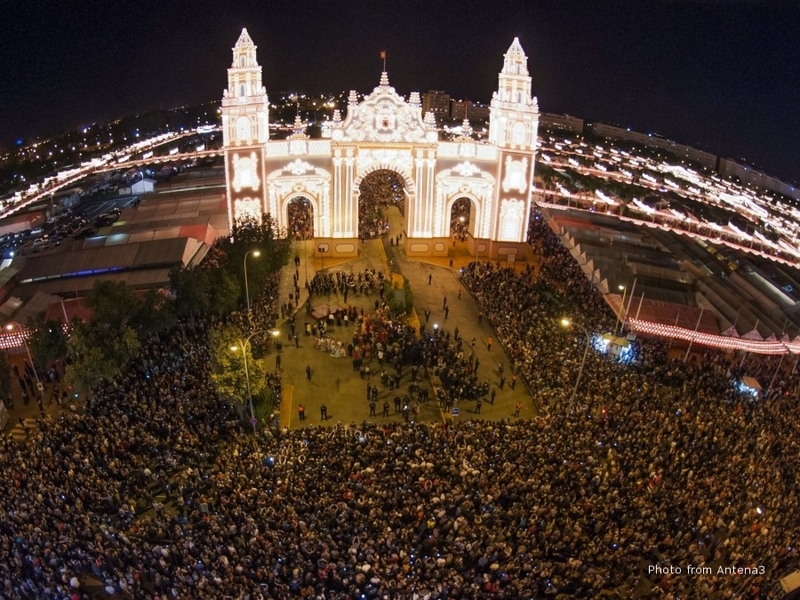 This event is called el alumbrao (in Andalusian Spanish) which means the lighting. This night is the most casual, as people don't start wearing their Flamenco attire until Tuesday. The next day the real fun begins! Everyone arrives to the Feria dressed to the nines. Ladies in traditional trajes de flamenca and gentleman in suits and ties. The dresses are absolutely stunning and come in all different colors, patterns and styles. They are also so unbelievably tight that sitting down, breathing, and eating are all daunting tasks. The first night I made the terrible mistake of putting on my dress before putting on my shoes. I was all zipped up, feeling accomplished and when I went down to put on my wedges, my dress tightened in all the wrong places and I thought I was going to rip it up the seam. I physically couldn't reach my feet. I fell onto my bed in defeat, dying laughing by myself at how ridiculous I must have looked. The dress works kind of like one of those Chinese finger traps- the more you fight it, the tighter it gets. Anyways, I ended up taking the whole thing off, putting on my shoes, and starting over again. Fun fact: They actually have a seamstress at the Feria in case you forget how daintily you need to move around and have a little accident. The shawl I wore is called a mantonsillo and some of them were sooo gorgeous- made of silk, velvet, and intricately embroidered. Huge hoop earrings are all the rage, as well as a big fake flower plopped right on top of your head. I did the flower on top one night, but the rest of the days it was off to the side or mixed with other flowers a lá Lana del Rey. I had too. A huge faux pas is to wear your hair down. 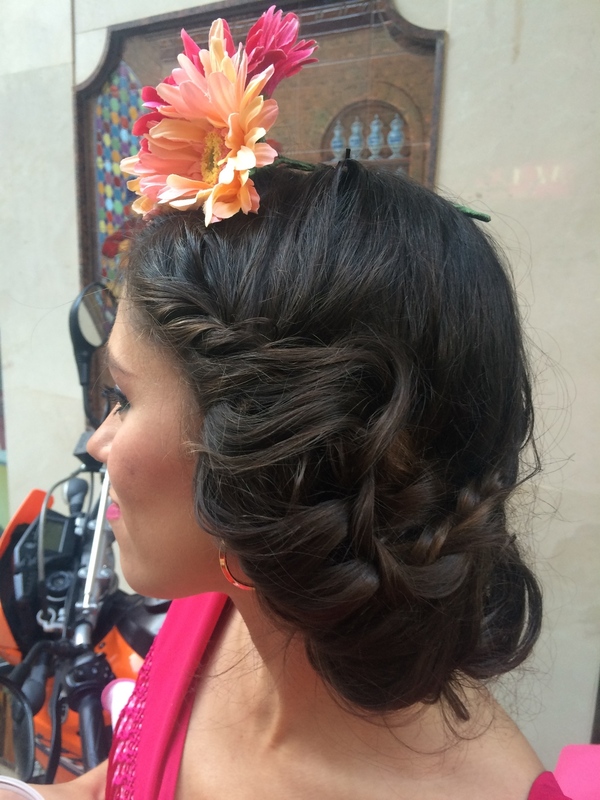 If you want to be a true flamenca, your hair is up off your shoulders and usually pulled into a pretty up-do. Also, no one brings a purse. Underneath all the fluffy ruffles of your dress is a little pocket to store your essentials- cash, keys, lipstick. The streets within in the grounds are all named after famous Spanish bullfighters (Juan Belmonte, Bombita, etc) and there are bullfights in the Plaza de Toros back in the city center every day of the Feria. It's common for the Spanish elite to go watch a bullfight, then hop in a super elegant coche de caballo (horse drawn carriage) and take it to the portada. During the day the streets are filled with people riding horses, whether they are pulling a carriage, or riding solo. Some of the ladies will even ride sidesaddle. The main drink of choice is called a rebujito, which is a mixture of manzanilla (a variety of sherry) and Sprite. It's dangerously refreshing. People eat tapas for lunch and dinner (obviously) and usually end the night with churros con chocolate (because every good night ends that way). Dancing is also a huge component of the Feria. Everyone is dancing sevillanas, which was influenced by Flamenco, but is unique to Sevilla. It is a four part dance with fancy hand movements and lots of twirls and turns. It's beautiful to watch, especially in the trajes de flamenca.